Experience Kimchi allows people to learn Korean history and culture through kimchi, offering kimchi-making guided by a professional kimchi instructor. 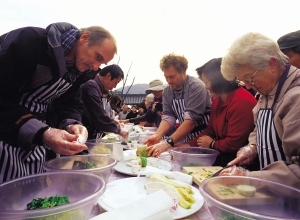 Participants can taste the kimchi they make, have it packed up, and take it overseas. In addition to kimchi-making, Experience Kimchi offers such experiences as trying on Hanboks (Korean traditional clothing). After the events, you will get a photo taken to keep the memories of Korea deep in your hearts.